Mc Donalds is the famous hamburger fast food restaurant. 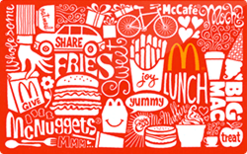 Buy a discounted gift card to save on your big mac, chicken tenders, mcd french fries, happy meal, and more. Works with any promotion or coupon.